Sevilla (Seville) is an easy hour and a half drive from Rota, and is home to the Cathedral of Seville, which is, by square footage, the largest Gothic-style structure in the world. It is the 3rd largest cathedral in the world, second only to St. Peter's in Rome and St. Paul's in England. The enormity of it is hard to grasp, and pictures certainly don't do it justice, but here are my best attempts. 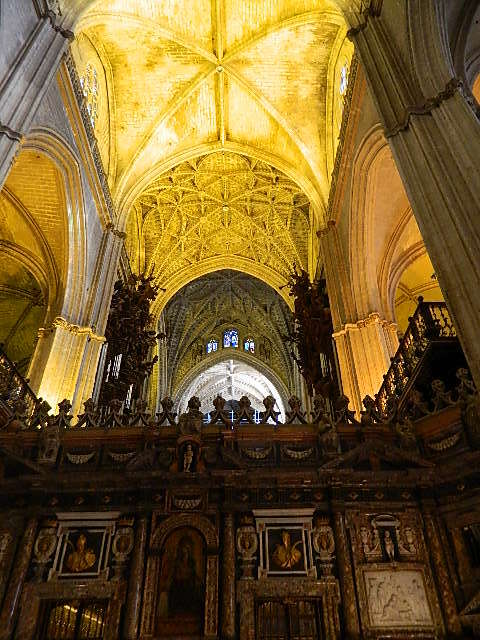 The interior ceilings in the main part of the cathedral are 120 ft high. Construction of this cathedral began in 1401, and took just over 100 years to complete. The cathedral is built on the site of what was formerly a mosque built by the Moors in the 12th century. In 1248, shortly after Christians reclaimed the city, the original mosque was consecrated as a cathedral. 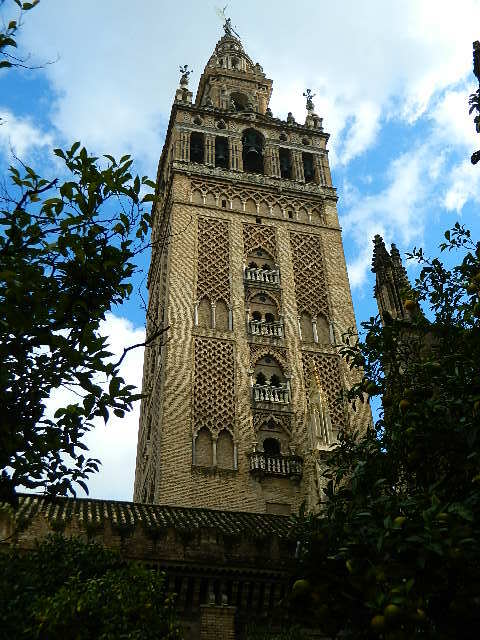 After an earthquake in the 1300's, much of the original mosque had collapsed but some parts survived, including the tower, which is now the lower section of the cathedral's famous bell tower (la Giralda), and the Patio de los Naranjas, a large courtyard filled with orange trees. In July, 1401, the Seville Chapter of Christians met and decided to replace the damaged mosque with a new, grand cathedral, stating, "We shall build such a large church that those who will see it finished will consider us mad!" The portion of the enormous tower that was original to the mosque is over 900 years old. Same with the courtyard of orange trees, which served as the interior patio of the original mosque. The inside of the tower was designed to accommodate a man on horseback riding to the top, so instead of stairs (except for one set at the very top), there is a series of ramps (36 in all), leading to the top. It's not a bad climb (I think around 300 ft.), and windows along the way provide amazing views as you make your ascent. Below is a view of Plaza de España (see the two towers in the distance?) 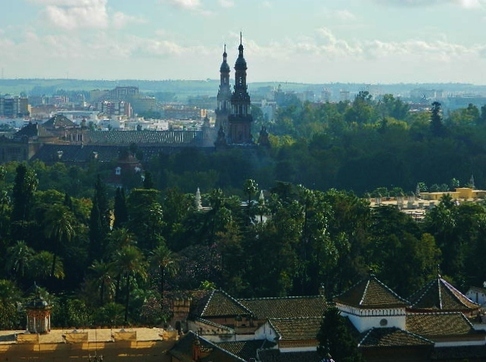 as seen from La Giralda. The Plaza de España was built for the Ibero-American Exposition World's Fair which was hosted in Seville in 1929. The Plaza de Espana complex is a huge half-circle of buildings, with a large fountain in the center plaza, which is surrounded by a moat. There are numerous tiled bridges over the moat between the plaza and the buildings. The walls of the Plaza are lined with tiles alcoves, each representing a different province of Spain. 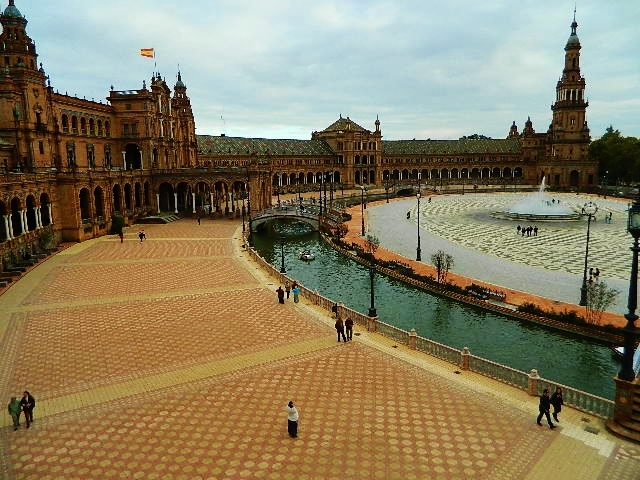 Plaza de España has been used as a film set for a number of movies because of it's "other-worldly" appeal. Scenes from Star Warsepisodes I and II, Lawrence of Arabia, and the 2012 film, The Dictator, have been filmed here.